Well. This is just a quick post which wanna to express my gratitude to thanks Joanne Chua, who is one of my club student/junior/friend. 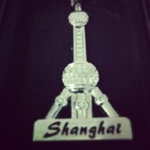 Thanks for the memorable souvenir all the way from Shang Hai =) I believed that you earned lots of fun and knowledge through the YTN Site Visit together with the rest of YTN scholars. Wish you all the best and continue success after your graduation =) Oh yah, wish you able to maintain your 4.0 CGPA in your this semester (Final Year Final Semester).